Water company United Utilities is set to reduce its yearly electricity bills and energy intensity by 10% after installing an energy flexibility platform which incorporates artificial intelligence (AI). The Warrington-based firm, which currently generates 21% of its electricity consumption through its own renewable arrays, will install the platform at two of its wastewater treatment plants in Bolton and Chorley by the end of the summer. The technology works by monitoring and managing electricity demand and generation within pumps, motors and biogas combined heat and power (CHP) engines to optimise energy use. The cost savings which United Utilities will make through the platform will then be passed on to its customers in the form of reduced water rates. “We are committed to providing safe, cost efficient and sustainable water and wastewater services to our customers, and behind-the-scenes energy is a pivotal part of our service,” said United Utilities’ energy manager Andy Pennick. The water firm aims to install the technology, called Dynamic Demand 2.0 and designed by Open Energi, in eight of its UK plants within the next year, representing up to 8MW of demand flexibility. 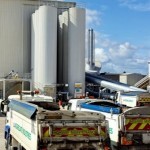 The move sees United Utilities become the second UK-based company to install the technology after heavy building materials firm Aggregate Industries. The water firm last week announced plans to electrify its entire fleet within the next decade, reducing its annual diesel consumption from four million litres to zero by 2028. It has also partnered with the Low Carbon Vehicle Partnership and the Northern Powerhouse to encourage other firms in North-west England to reduce their environmental footprint, and is working with Global Action Plan to accelerate the electric vehicle (EV) revolution in the UK.